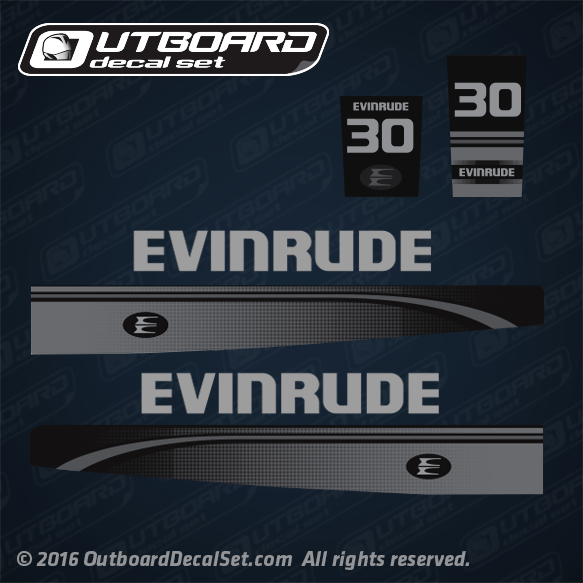 Black-silver color scheme custom decal kit for evinrude 30 hp from the mid 90's 1995, 1996,1997. Decal referenced as part number 0284824 and 0212711, 0212712 plate decals. EVINRUDE 1995 E30EEOB, E30ELEOB, E30REOB, E30RLEOB, E30TEEOB, E30TELEOB. EVINRUDE 1996 BE30BAEDE, BE30BALEDE, BE30EEDE, BE30ELEDE, E30EEDE, E30ELEDE, E30REDE, E30RLEDE, E30TEEDE, E30TELEDE ,HE30REDE, HE30RLEDE. EVINRUDE 1997 BE30BAEUD, BE30BALEUD ,BE30EEUD, BE30ELEUD, E30ELEUD, E30REUD, E30RLEUD, E30TEEUD, E30TELEUD.